The credentialing and re-credentialing process for a doctor’s office, provider network or hospital can be extremely time consuming and prohibitively expensive. Med Advantage works diligently to expedite the medical credentialing process and to reduce its cost through automation, large data centers, and a proprietary process & software. Med Advantage developed and maintains a proprietary database containing verified records of nearly 1 Million individual healthcare providers. Each has been credentialed by the company at least once. We also host a data center which links 98 primary data sources and information on over one million healthcare providers. The database includes providers in all 50 states, the District of Columbia and the Commonwealth of Puerto Rico. Our size, combined with our data management and verification capabilities make Med Advantage one of the leading companies in the CVO industry. Provider’s application is received from client or directly from provider. 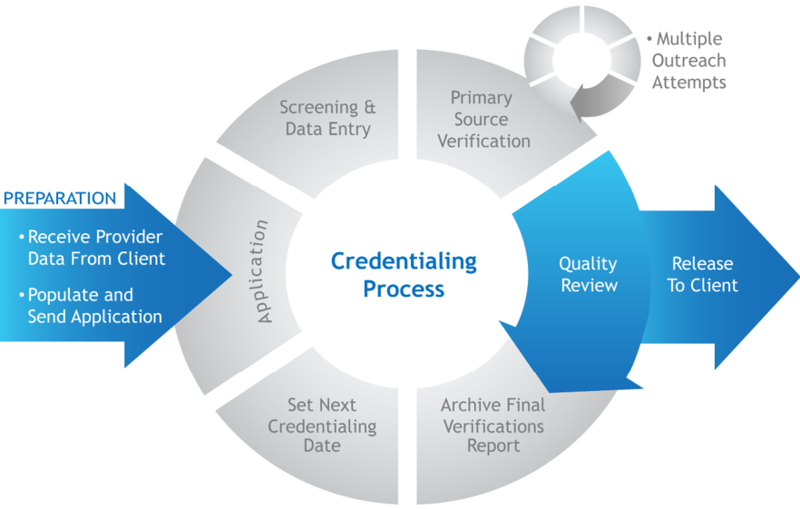 Information is entered into Med Advantage’s credentialing system. Appropriate letters and database inquiries are generated to verify the provider’s credentials. Verifications are updated in the credentialing database. All original documentation and verifications are sent to the client, as well as, electronic extractions as requested. When a company requests credentialing or re-credentialing of a specific healthcare provider or group of providers, they usually start by extracting provider data from their internal information system. Med Advantage’s proprietary credentialing system automatically converts that data into a usable format and matches it with information in our data warehouse. The matched data is then merged back into the company’s database to begin the application process. Data extract requests are an efficient way to credential large numbers of medical providers with minimal administrative effort, saving time, money and resources.